Discussion in 'Boat Design' started by HGR, Aug 21, 2018. Hi, I'm new to the forum and appreciate the fact that I don't have any history here. I have been reading for some time and am in the process of gathering up some information on Amphibious craft. I have had a few side projects recently and have begun construction on a reasonably large build. At this stage I would like a bit of feedback from some other people "in the know" on these types of projects. Particularly around retractable gear and how to avoid the pitfalls that can come with complications. Is this for fun or commercial use? What length, what displacement, how many passengers, what type of use in what type of waters/seas? Hi BlueBell, thanks for the welcome. I likely should have highlighted what I was after a bit further. Looking at that other forum that was referenced above around patents etc I'm really nervous about asking for any assistance around some build aspects. 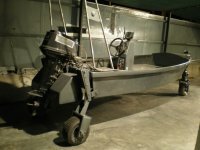 There are some photos on there that are really close to a fairly popular NZ amphibious boat builder and I'm wondering if there is any ability to chase up the original source of those photographs. Would be of great assistance to see where they came from and if it's possible to speak to the designer of that craft about how they navigated some patent issues. This is not a very good venue for talking about a patentable idea, being public domain and all. Are you staying you need help/advice with the patent process? I don't read between the lines very well. Hi guys. There are some photos posted by @myark on the mentioned topic that are very similar to a commercial amphibious boat builder's product. What I'm looking for is a reason that why, if that boat came out first as claimed, was it not able to be protected via copyright or patent protection. Seems that if someone came out with an idea, even for private use, getting ripped off by a commercial outfit would be a pretty significant issue. I am wondering if anyone has any further background data on those photos or that boat and could elaborate. I have a few items going through the patent protection process now and if the claim that the boat pictured was ripped off by a commercial operation I may need to rethink my approach. Point blank what I'm wanting is some background on the boat that was built and potentially copied. If anyone has any data that would be really beneficial. Bottom line is that if you make something and people see it and/or post pictures online or a magazine and its method of construction or function is obvious (ie; isn't a "trade secret") it becomes "public domain" and thereby not-patentable (or at least you've made your IP lawyer's job of defending you very hard). And if you never file a patent for it at all, or someone beats you to the punch by "filing first", you are fair game for anyone else to copy and steal ("derive" in polite company) it for fun and profit. As I understand it, a patent enables your ability to sue people/companies that may reproduce your project without permission and with the intent to profit from it. It might not protect you from a hobbyist duplicating your efforts for their own educational purposes. If someone in China copies your design, good luck collecting as the Chinese are notorious for not honoring intellectual property rights. Chances are if someone here likes your design they will attempt to improve upon it and may have their own set of rights protecting their modifications and or changes. I'm no lawyer, this is just my own understanding. By all means, post some of your sketches so your can get some feed-back. You can always hold a few important cards back. You do not have to share every idea, and if the process gets you closer to defining what you want to do, then you will only gain by having more eyes on it, and more opinions about it. Continuing to chase a bit of feedback without putting myself too far out there, does anyone have any knowledge of where these photos came from? Seems there are a few boats in the market with a similar rear system and just wondering if it's really a novel idea. The original thread states that it was built around 2000. I see several similarities to an existing amphibious craft including the hydraulic drive, retraction mechanisms, overall shape, etc. I would really like to know the history of this craft and why the owner was not able to seek any legal recourse if he was in fact copied. That would answer my legal queries and then we can get on to chatting about more fun things, like actually building one. Is this from someone in NZ? I don't know about elsewhere but the US Patent Office (and Google...) has a searchable index of all of its patents. You could look up all the patents related to this kind of contraption and see the prior art and who still has a current patent. I am willing the bet the basic concept of a boat with deployable wheeled outriggers is loooong since expired and any designs will all tend to look similar. It could simply be that there just isn't a viable market demand for such a thing. People are always trying to reinvent the latest-greatest self licking icecream cone (flying cars, personal transporters, etc. ) but they fall flat because the tech or market isn't ready for them. So they pop up and then fade away until the next guy gives it a go until his or his investor's money runs out. Hi James, I agree. There is a NZ company who holds patents that are still current which are almost identical to the design in the photos. Trick is those patents start in 2003 so if the above boat was built prior then one would have to think that those patents are not valid and there is also no claim for copyright. So, if anyone has some data on that boat in the photos it would clarify this whole thing quite a bit for me. Are you referring to "Sealegs"? If they hold the patent then they pretty much have the design and it doesn't matter what anyone else did before hand. For all I (you?) know, those are photos of their prototype and the claimant is just another internet loon. If he did have a valid case, lawyering up isn't hard, but it is expensive, which is why some get away with it. Life an't fair. You could try and start a private conversation thing with MYARK as he would know more about it. He manufactures things in China and Thailand I believe and Kean Foo sounds Asian. If he doesn't answer you could do the same with Tom Kane and maybe find out how to get hold of MYARK as they are good friends. Tom Kane posted immediately before the post that the photos came from. Working at home with models of Lego and wood, he came up with a concept for an amphibious boat – one that could drive down the beach and into the water and out again under its own power. Then he bolted on three motorised wheels on retractable stainless steel legs. "It took a fair bit of courage to take to my new boat with an electric drill," Maurice says, "but with a bit of trial and error, everything came together." The importance Sealegs International Ltd places on its intellectual property is demonstrated by numerous patents, design and trade marks registered around the world. Post #59 does say electric motors and hydraulic drive, whereas "Sealegs" is electric hub motors. That is probably enough difference to avoid any expensive patent challenges. 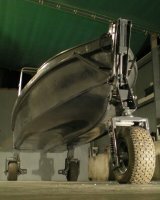 I'm wondering if the Sealegs patent covers all three methods listed in the link below, and maybe hydraulic and other types of hydrostatic drives. Seems to me that Sealegs was hub drive from the start and remains so today. EDIT: Okay, now I'm officially confused. I re-read the 2015 article, they experimented with direct electric hub drive then went to the other drive system. I'm guessing hub motors didn't have the torque.